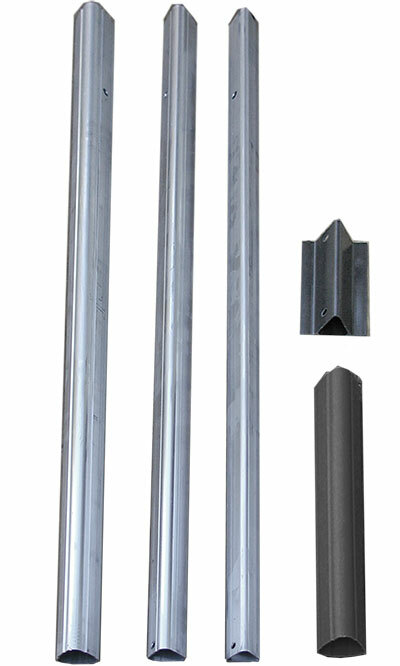 Perfectly support your existing bat house with the S&K Telescoping Bat House Pole with Ground Socket. This unique, lasting pole is crafted from three pieces of durable, aircraft aluminum, which, when combined, extend to just over 15' tall. The triangular shape of each pole section provides plenty of strength, perfectly accommodating a bat house up to 20 pounds. Keys keep the telescoping sections in place, and may be loosened for you to raise and lower the pole with ease. The included, plastic adapter attaches to the back of your bat house, and then slides over the top of the pole to place the home at the right height for bats. Place the included ground socket in your soil for added stability, and set it in concrete for the utmost support. This allows you to remove the main pole for seasonal maintenance if desired. Lasting, aircraft aluminum creates a durable pole, perfect for use for many seasons. Ensure your existing bat house is displayed well with this Bat House Pole with Ground Socket.